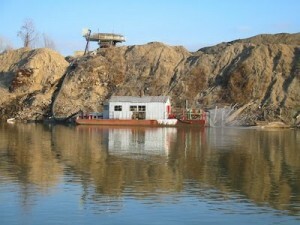 Kaw Valley Companies has three in-river dredging permits on the Kansas River. 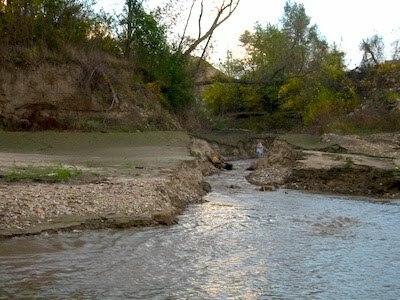 This permit is located just south east of the Turner Bridge (Hwy 32) in Kansas City, Kansas. 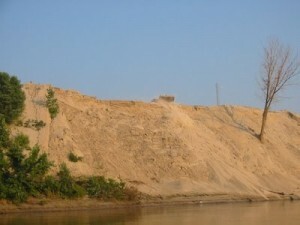 The picture on the left below was taken by Laura Calwell, Kansas Riverkeeper, on June 23, 2005 and documents the use of a top loader to return sand not suitable for sale to the Kansas River. 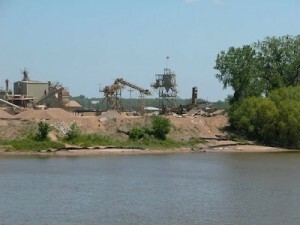 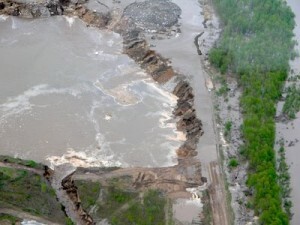 This incident was reported to the Army Corps of Engineers, Kansas Department of Health and Environment (KDHE) and EPA. Kaw Valley Companies did not have a 404 permit to deposit fill into waters of the United States and was eventually fined by EPA and ordered to clean up their operation both above and below the high water mark. 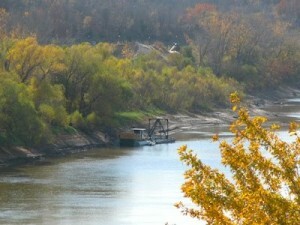 In the fall of 2005 a dredge was placed in the river but was removed after several months pictured below on the right. 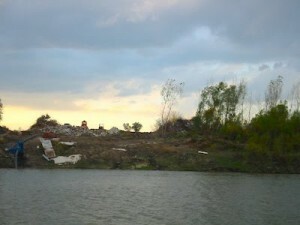 To FOK’s knowledge this was the only time this site has been actively dredged in recent years. 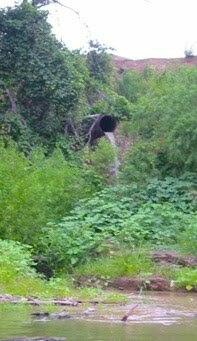 This permit is located east of I-435 and down river from the WaterOne coffer dam. The in-river dredge operates from the south bank (pictured above on the left) but Kaw Valley Companies has a pit mine operation on the north side of the river (pictured below.) Friends of the Kaw has investigated and filed complaints concerning the operation of the pit mine on several occasions. This operation returns slurry water separated from harvested sand back to the river right down the bank. This creates the gully you see above on the right causing additional sediment to be picked up from the bank as the water returns to the river.